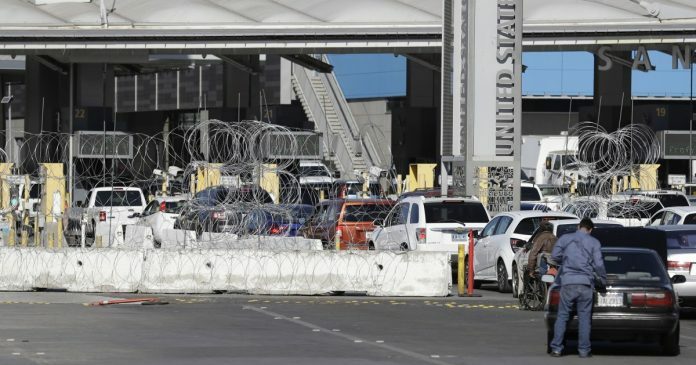 An unspecified number of “temporary impediment measures,” or objects meant to block people from entering, including razor wire and Jersey barriers, were being set up at the port. “After the materials are in position, CBP will resume processing northbound vehicle traffic in select lanes at the border crossing,” CBP said. In a follow-up email, a CBP spokesperson confirmed the shutdown was being done to prepare for the potential arrival of thousands of additional people at the border. Travel flowing southbound was unaffected by Monday’s move. People crossing on foot were directed to the Pedestrian West facility while the east one was closed. Last week, CBP shut down a few lanes at San Ysidro and the nearby Otay Mesa port to install and pre-position similar blockades. CBP did not state how long all northbound traffic was suspended Monday. CBP Commissioner Kevin McAleenan told reporters at a recent press conference announcing a troop deployment that some migrants who are unable to apply for asylum at ports due to limitations in the number of people officers can process in a day might instead choose to illegally enter the country. An estimated 1,700 people were apprehended and deemed inadmissible at ports of entry each day in October across the entire southern border.